Bordeaux is the largest and most important wine growing region in Europe, if not the world. Its vineyards extend over 125,000 hectares and the average size of an estate is 17 hectares. Bordeaux has more appellations than any other European region with 60 different names. There are between 7,000 and 7,500 domains making 10,000 different wines. If all these figures are confusing, it is simpler to remember that Bordeaux is BIG: Big area, big wines, big business. All wine that is not divided into smaller appellations (such as St. Emilion or Margaux) is sold as generic Bordeaux or Bordeaux Supérieur. This can include land owned by the famous chateaux such as Chateau Mouton Rothschild that is not within a higher appellation, styles of wine not allowed within a higher appellation (such as white wines made in the Médoc or St. Emilion) and vineyards of the Entre-deux-Mers. Both red and white wines can be labeled with the Bordeaux appellation and primarily the wines bottled by Bordeaux negociants with a brand label use this. The grape varieties for both red and white Bordeaux are chiefly Merlot and Cabernet Sauvignon for the reds and Sauvignon Blanc and Semillon for the whites. Merlot and Sauvignon Blanc are the most widely planted red and white grape variety respectively. Bordeaux Supérieur wines are higher quality wines than AOC Bordeaux. They are aged for one year at least in oak barrels, have lower yields and higher potential alcohol levels. They are also produced at the estate level rather than by growers selling to the Bordeaux wine merchants (or negociants). 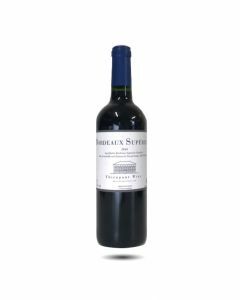 Bordeaux Supérieur covers a vast area of Bordeaux that is not specific to one geographical origin. These wines often represent outstanding value for money and include several well-known names.